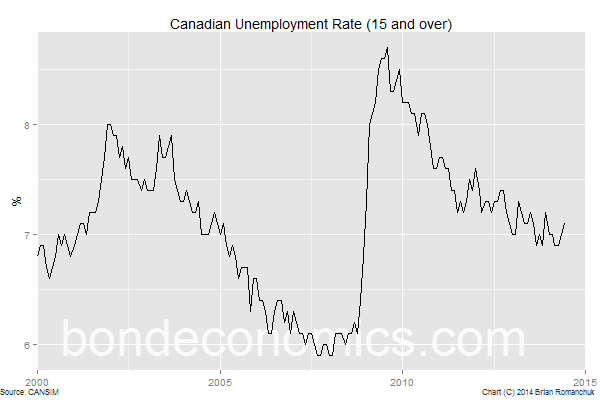 I am just catching up some data, and I wanted to highlight the rather tepid Canadian employment data for June. There is no sign that the economy is building up towards "escape velocity"; rather, the job market is decelerating. Given the magnitude of the Canadian housing bubble, that is not what policy makers want to hear. The chart at the top shows the unemployment rate. Unlike the U.S., the participation rate has been steady, and so progress in reducing the unemployment rate has stalled. In June 2014, it was 7.1%. By way of comparison, the unemployment rate first hit 7.2% in July 2011 - almost exactly three years earlier. In other words, despite an epic commodities bull market and still massive condo construction, there has been almost no reduction of slack in the labour market. 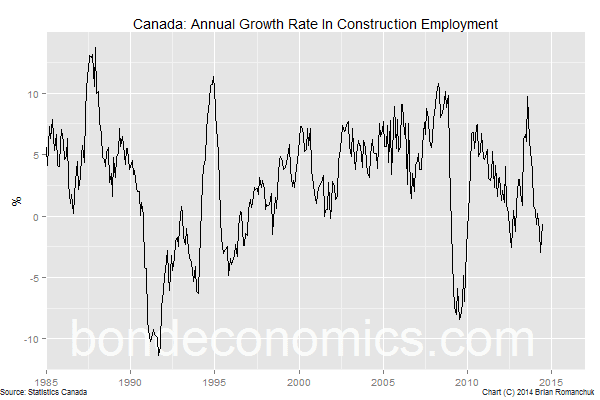 The chart above, which depicts the aggregate growth rate of employment, does not inspire confidence in the outlook. Above we see one of the culprits behind sluggish job growth - construction is no longer creating jobs on a year-over-year basis. Meanwhile, as the construction projects in the pipeline are completed, this sector is likely to become a drag on overall employment growth. Barring some form of growth miracle in the United States, or some pass-through from energy into core inflation, it is hard to see the Bank of Canada doing anything other than sitting on the sidelines for a considerable period. "Why the Canadian Economy Is Doomed..."